Managing sale listings can be a hard process for an admin. It’s quite hard to go through your catalog and add or remove products that have a special price to a certain category called “Sale” or something similar. 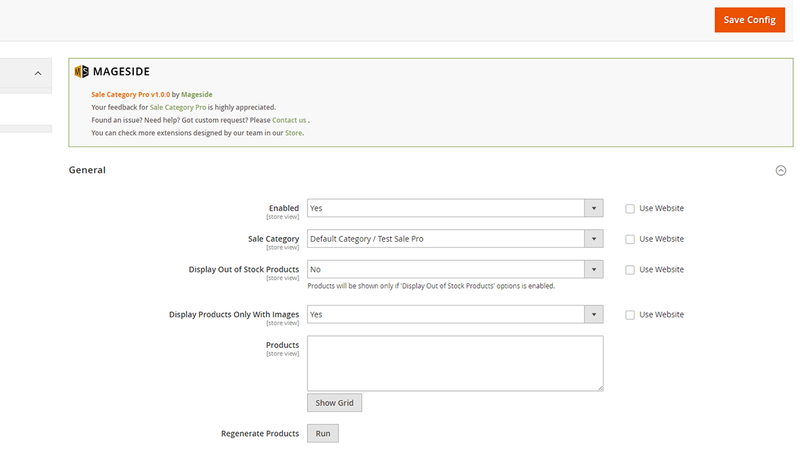 Now we have a great solution for you that will help you to add/remove products from Sale Category automatically. It’s the Sale Category PRO extension. No more manual intervention. Just select a product, set up a special price for it (the special price should be lower than regular price) and click “Save” button and the product will automatically appear in the Sale Category. 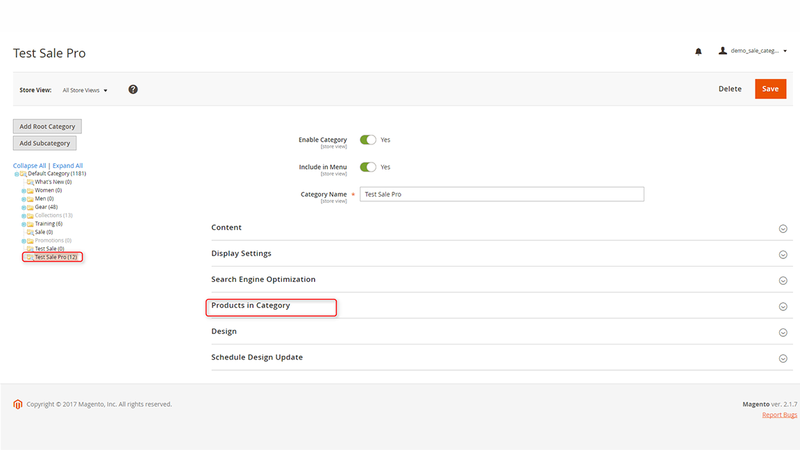 In the configuration panel of the Sale Category PRO extension, an admin can enable/disable the extension and set up other settings of the Sale Category PRO. The products will be removed from the sale category automatically after the expiration date of the product’s sale. You just need to set up a date when the sale ends in the configuration panel. Database renews all sale categories. 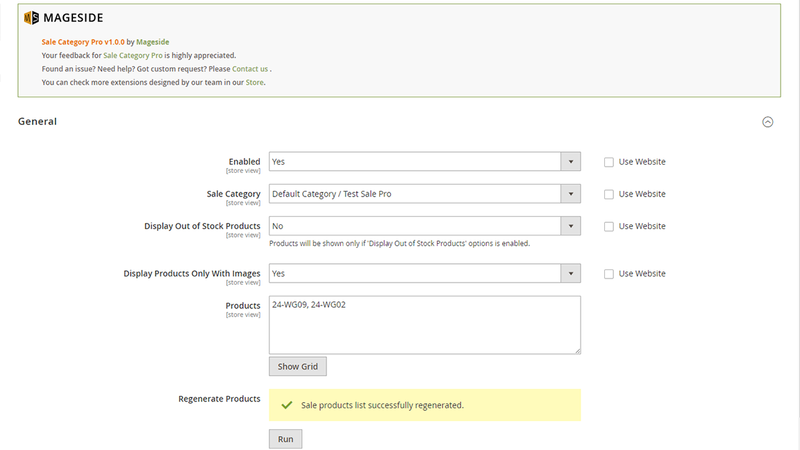 Database renews all sale categories once a day by cron or you can regenerate products right from configuration panel. 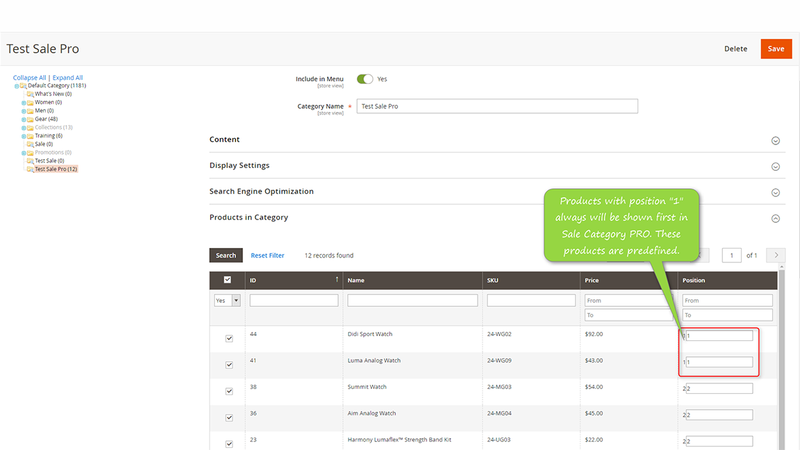 List of products in Sale Category PRO will be renewed automatically or manually by clicking the button of regenerating products. Set up which products will be shown no matter what in Sale Category PRO. It’s no matter whether a product has a special price or not. The selected product will be shown first and other products will be shown after predefined products. 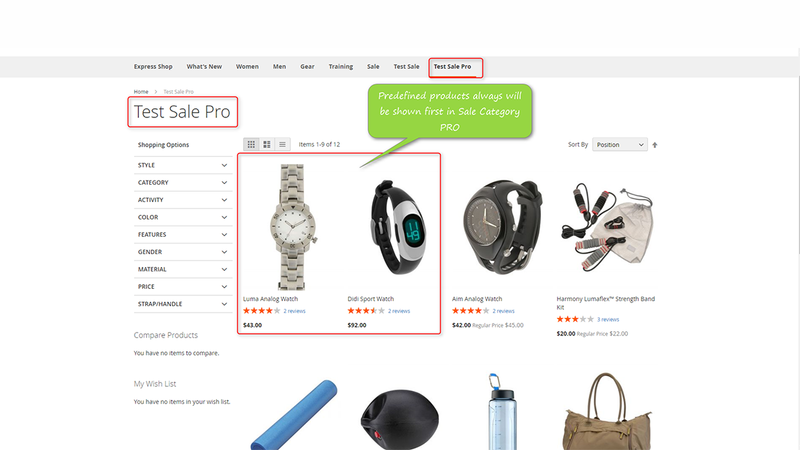 In Sale Category PRO are shown shopping filters now. 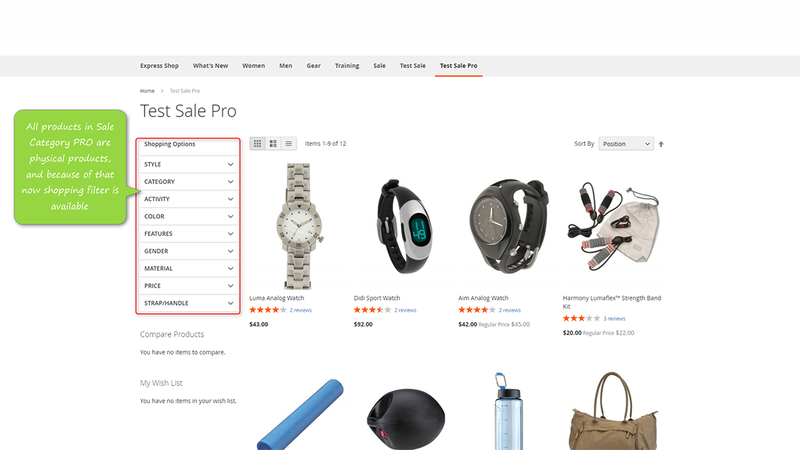 While the products which are in Sale Category PRO are physical products now, the shopping filters appear in Sale Category PRO so a customer can find a product quickly and easily. This module has a very simple configuration. No specific programming knowledge is required. Everything is easy to use and very understandable. Imagine how much time you should spend if hundreds of products needed to be added/removed to/from the sale category every day. With our module Sale Category PRO, you don’t need anymore to do it manually. Everything will be done automatically. Install this excellent extension and save hours of your time. 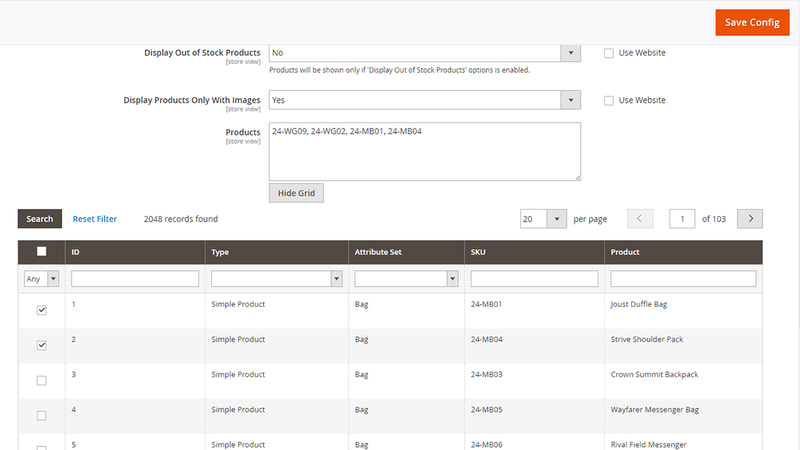 Configure which products shouldn't be shown, if a product is out of stock or a product has no image. 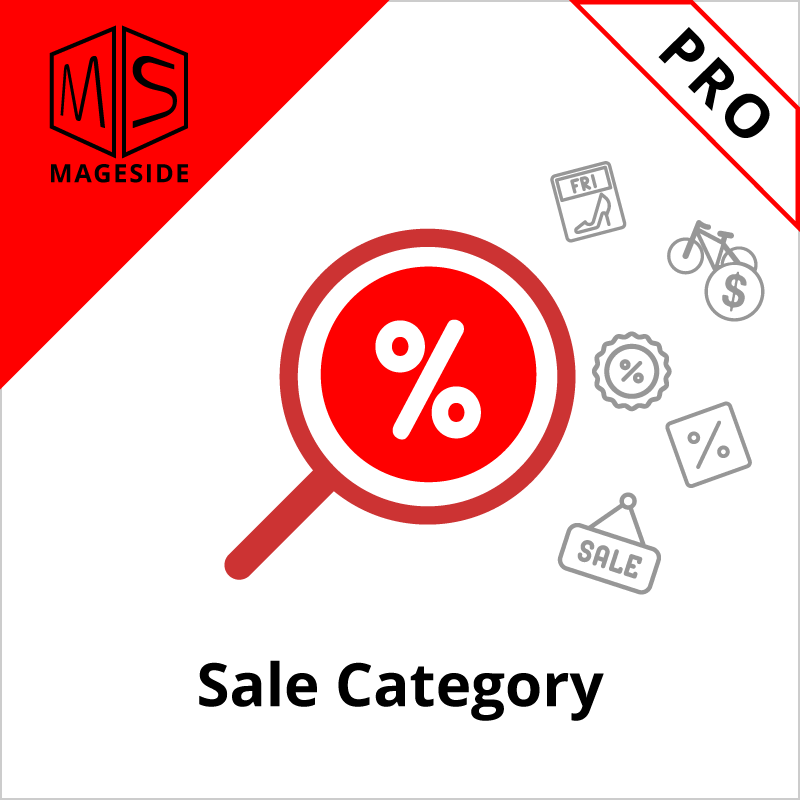 Install the Sale Category PRO extension and the products will be automatically added to the Sale Category as they go on sale and will be removed when the sale ends. The less maintenance we have to do on the site the better and sale categories are always a pain. Now just set the price and it's added to the sale category.